In a city filled with the most fickle fan base in all of sports, Carmelo Anthony is skating on pretty thin ice. "It's definitely an opportunity that I'm willing to explore and experience," the six-time All-Star said last week when asked about free agency and opting out of his contract. But hold on, New York. Don't grab your weapons and form an angry mob just yet. "That doesn't mean I'm not coming back to New York or I don't want to be here. I don't want anyone to get that impression," he continued. So what is Anthony saying? Is he in New York for the long run, or will this be his final season in the Big Apple? Yes, Melo wants to be a free agent. Not necessarily because he wants to leave, but because he wants the thrill of feeling wanted by everyone. Plus, he wants all that extra cash the Knicks could offer; in upwards of $33 million more than any other team can. $33 million more will only sound enticing to Anthony if the Knicks can get him a title. Look at his counterparts from the notorious 2003 draft class; LeBron has multiple rings. Chris Bosh has multiple rings. Dwyane Wade has multiple rings. Even lower-tier players from the class of '03 have won championships (see Sasha Pavlovic, Josh Howard, Boris Diaw and Kendrick Perkins). The Knicks hold a very distinct advantage here, because Melo wants to be in NYC. Staying put allows him to potentially be Carmelo Anthony the brand, not just Carmelo Anthony the All-Star player. Not to mention, if he can help bring a title to the city, he will instantly go down as one of the greatest Knicks of all time. Those are reasons few would pass on. At this stage of his career, Melo has gone as far as he can go by himself. By continuing to entertain questions about his impending free agency, he's basically saying, "I don't want to leave, but I will. Help me get a ring, or else the next thing I'll need help with is packing my things to move to a new city." 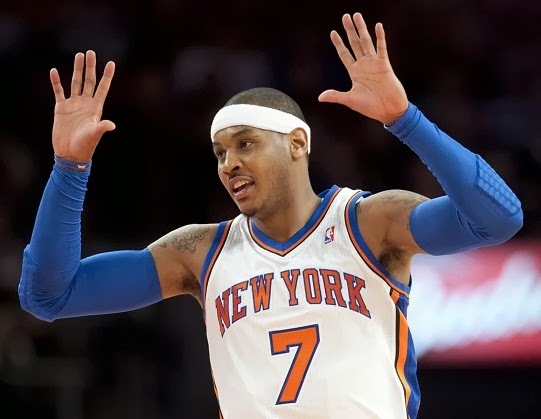 If the Knicks actually believe that Andrea Bargnani is the Robin to Melo's Batman, they should probably expect Anthony to take his career 25-point average to a new franchise at season's end. He might even join forces with another superstar and create another "super team." Or, he may just take his talents to South Beach. Knick front office, the ball is in your court. What happens next is up to you. Can we watch the Knicks melt down first? DAMN! Season hasn't even started yet lol.